A tall glass of yum, by the looks of it. But I'd argue that a nice pale ale is never truly out of season (it's almost winter up here in the US). I'm planning a gluten-free batch this January--I will probably take a leaf from your page. Keep up the good work! I couldn't agree more. 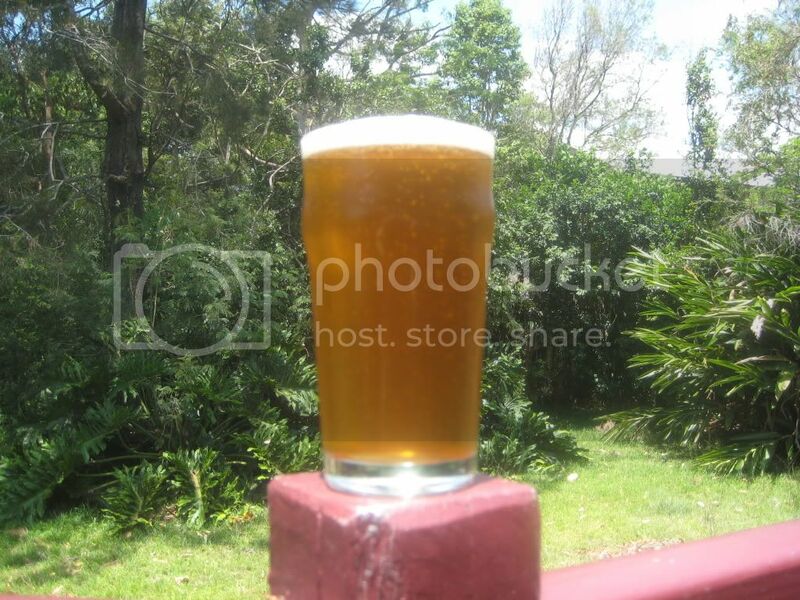 Pale Ale is a great all year round beer. And I'm hop mad! The perfect combo. Anything you would do differently with this beer? I love SNPA and was thinking of giving your recipe a try. So far my GF brews have turned out decent but not great and I am getting minimal head and zero head retention. I am hoping the maltodextrin will help this. I have a GF Sorghum/Millet PA in bottles that I have high hopes for but its not ready yet...still needs a few more weeks to condition. If you don't mind honey then maybe try swapping that with the demerara sugar. And dry hop lots with Cascade. Maltodextrine should help the head retention. And if not head retention, at least good lacing. Certain yeasts also perform well for head retention. S-33 being the best so far, then US-05. WB-06 and T-58 have none. Feel free to drop by with some feedback on the recipe when you're done. Interested to see how it works out for you. Brewed this today but used the S-33 yeast instead of the US-05...hoping for better head retention. I'll let ya know how it turns out. Smelled good going into the carboy. Yes definitely. I was considering using S-33 with an IPA, but this will also replicate what I was going to try well. I am planning on bottling this up on satuday. The S-33 yeast was a very rapid fermenter with very little airlock activity less than 1 week after brewing. The hops and yeast dropped out like a brick...almost overnight. Beer looks good...nice and clear now with a slight amber tent to it. I guess this is the demara sugar. I have had issues with not enough carbonation on my GF brews in the past..how much priming sugar did you use for this beer and how long did you bottle condition before drinking? I think part of my problem is i'm carbonating/conditioning at 62-64 degress when I should be closer to 70. This is probably why my beers seem to take so long to carbonate/mature. Yeah, I have trouble in winter with US-05 beers carbonating. I find WB-06 is very quick to carb in the bottle (although it's not as clean flavoured as US-05). I put two teaspoons of cane sugar in each 740ml bottle, and one teaspoon in with the 330ml bottles. S-33 is a really nice trappist yeast and tastes great when you don't use whirlfloc/irish moss. I dare say it won't add much yeast flavour if you've added clearing agents, which works well with this recipe. Have you tried a sample from the fermenter to see how it tastes? Also remember to rely on gravity readings. I have not tried a sample so I can't say how it is as of yet...I don't have a hydrometer as i'm a beginner..this is only my 4th batch but I plan on getting one before my next brew. I would think the beer is done as I have no airlock activity and everything has settled out..fermenting at 66 degrees and satuday will be 2 weeks. I was planning on bottling on saturday but will give it more time if you think its necessary. The color is more amber than the pic that you had posted but that could change b/w now and when I drink the first brew. I will try and post a pic this weekend sometime. SN is one of my fav beers so I am excited about having a GF option now that I can't drink real beer. I did use wirlfloc but hopefully the beer will still have good flavor and i'm hoping the demara sugar and cascade hops will help mask the sorghum twang/off flavor. Yeah definitely interested in how your sample tastes and how it finally turns out. I've added myself (Brewman101) as a follower to the blog so that you can message me direct if you like. Bottled this up today. Had a darker color than your SN Clone but still looked good. Taste was good...nice and hoppy but not too bitter. Hard to tell from the fermenter sample but I did not get any of the sorghum twang/sourness in the sample I tasted. Was a bit thin even with the maltodextrin but I was not going for a really heavy bodied beer anyways. Will let ya know how it turns out once its carbed up. Excellent, sounds like you're having even better luck than I did with this recipe. Might try it again this year with some buckwheat honey. Hope to hear from you again in four weeks time. I currently have an ESB fermeting that I made with sorghum, malted millet, rice solids, and rolled GF oats. I've got high hopes for this one...smells great so far. That's excellent news, very glad it worked out for you. I've followed your lead and rebrewed the Angry Scotsman IPA last weekend with S-33. Hoping this works out well. I upped the maltodextrine to 6 ounces in the AS IPA so that may become the new standard amount. I have seen a few people brew with gluten free oats and they made some very tasty looking beers. Be sure to tell us how it goes. Did you malt the millet yourself or go through the supplier you mentioned? And I'll add it to the site. I got the millet already malted from the supplier...they have it in Red, white and pilsner. I was going to toast/roast the millet for the ESB to add some color but I had them crack it for me as I don't have a mill so I could not toast it. Next time I order I may get it uncracked so I can experiment with toasting it to add some darker colors/flavors to the beer. I have heard that adding GF oats will help the body and head retention. I will report back once the ESB is done. Have you ever tried dry hopping any of your beers? I have a question for you... I used this recipe as a base for my GF IPA and I love it. Its also tested well with some beer enthusiasts around my parts, as they can't pick up the sorghum flavor at all. What exactly are you using the demerrara sugar for? For sweetness? Or have you just determined that this masks the sorghum flavor really well? I thought about experimenting with putting some in my other gluten free beers but not sure how it would impact the finished flavor (whit style beer, brown ale, etc.). Any thoughts/tips would be appreciated! Glad you had success with this. With sorghum you're really challenged by three major things. * Residual sweetness - I find this is down to sorghum not fermenting out as much as I'd like. To counter this I always add some sugar to "dry it out". Demerara, raw sugar, invert sugar all work well to do this. * A medicinal flavour - I find this happens when it ferments too warm. Not likely to be a problem for North Americans this time of year. US-05 ferments quite clean so always recommend it for IPA's and Pale Ales. I'm about to try a new yeast which is supposedly even cleaner. Time will tell if they're right. Be sure to check out homebrewtalk forums for lots of wit, brown ale and other assorted recipes. They've been a big help to me. First off, I love the website and it has been so helpful in picking my first GF brew. I'm new to beer brewing in general, but wanted to give GF a try since I got all my equipment from someone that recently became gluten free and this gave up beer brewing. I just had a couple of questions regarding the SNPA GF brew after looking at the recipe and reading all of the comments. 1) I saw that you commented to dry hop some of the cascade hops. Did you rack to a second fermenter after a week or so to do this or add directly to the primary? 2) It sounds like you added the cane sugar directly to the bottles. Is there any benefit to doing this vs boiling the sugar in water and adding directly to the batch to bottle? Thanks for the feedback. I recently re-brewed this beer with the following hopping guidelines. http://forum.northernbrewer.com/viewtopic.php?t=15532 These are straight from Sierra Nevada and I found it turned out awesome. I'll make a post soon with the revised recipe. 1. There is lots of info about not using secondary. Where as people used to think it was important they've now turned around and said, unless you're using a conical fermenter or racking onto fruit it's a waste of time plus an increased risk of infection. Grab a stocking sock from the super market plain coloured, boil it it, spray it with sanitiser. Add your hops and tie it off. No infection and the hop bits don't end up in your final bottles. 2. The way I do it is the wrong way. Boiling up sugar water is actually the proper way to do it. I've just never learnt it. I recommend doing it that way. 0.50 oz. Magnum Pellet 13.60 25.4 60 min. 0.50 oz. Perle Pellet 7.70 7.3 30 min. 1.00 oz. Cascade Pellet 5.80 4.3 10 min. 2.00 oz. Cascade Pellet 5.45 0.0 0 min. Bruce you are bloody legend! Thank you very much for sharing that.